Parties, races, culinary delights and more await guests during the upcoming fall season. 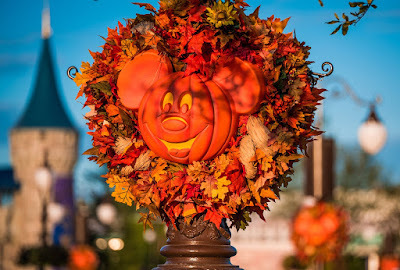 Tastes, toys, treats and more are all on the menu this fall at Walt Disney World Resort. From culinary creations to sporting events to special parties, there are many different ways to fall into magic during the cool-down season, both in the theme parks and all across the resort. The grandest of the festival’s don’t-miss tasting events, Party for the Senses in World ShowPlace, will welcome acclaimed chefs and vintners Sept. 22, Oct. 6, 13, 20 and Nov. 10. They will showcase creative bites and palate-pleasing sips with sensational live entertainment. “Eat to the Beat” concerts – 225 in all – will rev up the America Gardens Theatre stage three times nightly with new musical acts including Vertical Horizon, 98 Degrees, Sheila E. and others. Selections span a broad range of eras and genres from rock and pop to rhythm and blues. “Mix It, Make It, Celebrate It!” hands-on workshops Wednesdays and Thursdays provide new opportunities for guests to interact with visiting chefs, mixologists and other pros. A Ratatouille-inspired adventure is back as Chef Remy encourages families to play together during Remy’s Ratatouille Hid ‘n’ Squeak scavenger hunt. On Friday and Saturday evenings, enjoy an interactive Character Dance Party. In the new Junior Chef Kitchen, children become the chefs and eat what they make in this complimentary experience each Sunday in the Festival Center. This is just an appetizer for what’s to come this fall. The 23rd Epcot International Food & Wine Festival is included with theme park admission, but certain programs require a separate ticket and/or reservation; for full details, visit TasteEpcot.com. Let’s boo this! There are even more nights to celebrate the spooky season this year during Mickey’s Not-So-Scary Halloween Party. This special-ticket event runs select nights Aug. 17-Oct. 31 at Magic Kingdom Park – the earliest in the calendar year it’s ever started. It’s also the 25th anniversary of Walt Disney Pictures’ “Hocus Pocus,” so what better way to celebrate the film than the spellbinding Hocus Pocus Villain Spectacular at Cinderella Castle, where the Sanderson Sisters take “stage fright” to another level. Guests should keep their eyes open for dancing ghosts, the Headless Horseman, plus Mickey Mouse, Peter Pan and many more beloved Disney Characters in the Mickey’s “Boo-To-You” Halloween Parade. There will also be plenty of sweets for all trick-or-treaters around the park, including allergy-friendly options. And each night during the party, the skies above an eerily lit Cinderella Castle come alive during Happy HalloWishes, a magical fireworks extravaganza that definitely goes bump in the night! Advance tickets start at $75 for adults and $70 for ages 3-9 (plus tax). For a full list of event dates, visit MickeyHalloween.com. Guests are encouraged to purchase tickets in advance, as space each night is limited. For more information, call (407) WDISNEY (934-7639). Where better to spend a beautiful fall day than playing in Andy’s backyard, the young toy owner from Pixar Animation Studios’ Toy Story films. In this extraordinary new land at Disney’s Hollywood Studios, guests are “honorary toys” surrounded by Andy’s favorites – Woody, Buzz Lightyear, Jessie and many more. Across 11 fun-filled acres, guests can hop on the all-new Slinky Dog Dash for a family-friendly roller coaster ride, take a spin and enjoy some interstellar beats on Alien Swirling Saucers and go for the high score playing midway games inside the 4D world of Toy Story Mania! When toys get hungry, there’s no better place to grab a bite than Woody’s Lunch Box, a walk-up window featuring a bevy of nostalgic delights – from a grilled three-cheese sandwich to a Lunch Box Tart and much more. Toy Story Land also offers a collection of new merchandise items, allowing guests to take their special memories home with them. Among the many highlights: a Buzz Lightyear Bubble Blower and a Slinky Dog headband. James Beard Award-winning Chef José Andrés – one of “The 100 Most Influential People of 2018” according to Time.com – will open a new location of his popular Jaleo this fall. It will offer an extensive menu of tapas that reflects the rich regional diversity of traditional and contemporary Spanish cuisine. Designed by renowned Spanish designer Juli Capella, the new multi-level restaurant will feature breathtaking exterior architecture and a vibrant, theatrical décor representing the colorful, dynamic culture of Spain. Andrés’ Disney Springs venue will be his largest and most ambitious location to date. A new restaurant by James Beard Award-winning Chef Wolfgang Puck will also open this fall. Wolfgang Puck Bar & Grill will modernize the traditional “bar and grill” concept in a setting inspired by traditional farmhouses – with a touch of elegance. The restaurant will capture the essence of laid-back California dining made popular by Puck’s Spago, his flagship restaurant in Los Angeles. In late fall, Disney Springs will reveal the newly reimagined World of Disney store, where guests will discover the products they love from Disney Parks in a dynamic and distinctly Disney environment. The flagship store remains open throughout the enhancement process. The “Ultimate Disney Fall into Magic Package” is available this year for the week of Labor Day. The limited-time offer, available for booking through Aug. 19, includes a five-night stay at a select Disney Moderate, Deluxe or Deluxe Villa resort hotel for arrival Sept. 3 and departure Sept. 8, 2018. The package also features four-day Magic Your Way tickets and an itinerary full of special experiences in all four parks – including access to Mickey’s Not-So-Scary Halloween Party and two hours of exclusive evening access to Toy Story Land at Disney’s Hollywood Studios. Packages start at $149 per person, per night for a family of four in a standard room at Disney’s Caribbean Beach Resort. For more information, visit https://disneyworld.disney.go.com/special-offers/ultimate-fall-magic-package.